BERKELEY –The Bears will be dancing once again! 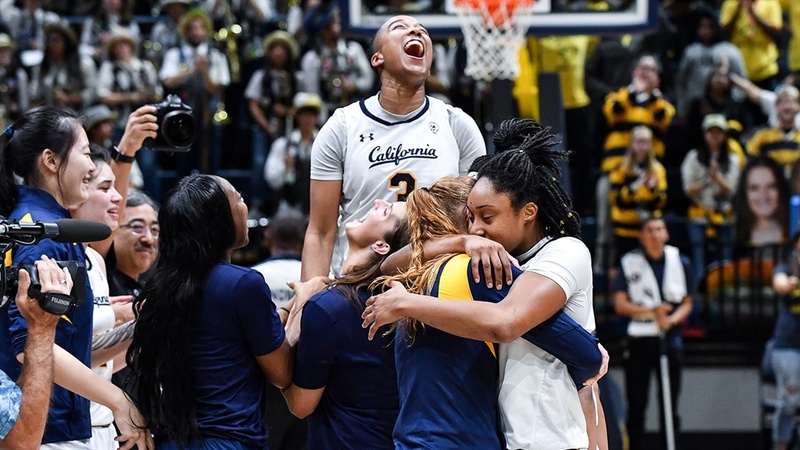 The NCAA Women's Basketball Selection Committee revealed the bracket for the 2018 NCAA Women's Championship on Monday afternoon and Cal has earned an at-large bid for the second consecutive season. The Golden Bears (21-10, 11-7 Pac-12) received a No. 7 seed and will face 10-seed opponent Virginia (18-13, 10-6 ACC) on Friday at 2 p.m. PT in Columbia, S.C, airing live on ESPN2. The entire 2018 Women's NCAA Tournament will be carried live on the ESPN family of networks. This is Cal's 13th appearance in the NCAA Tournament and its sixth in the last seven seasons. Cal has reached at least the second round in each of its last seven appearances in the NCAA Tournament, highlighted by a trip to Final Four in 2013. The Bears earned a nine-seed in last year's tournament and upset eight-seed LSU, 55-52, in opening round in Waco, Texas, before falling to the region's top-seed, Baylor, in the second round. The No. 7 seed in the Albany region, this is Cal's highest seed since earning a four seed in 2015. The winner of Friday's matchup between the Bears and Cavaliers will face the winner of No. 2-seed South Carolina vs. No. 15-seed N.C. A&T State for a chance to make the Sweet Sixteen. The Cavaliers are coached by former head coach of the Golden Bears, Joanne Boyle. Cal is one of six teams from the Pac-12 in the tournament field, marking the first time in conference history that six or more teams have made the NCAA Tournament in back-to-back seasons. After a one-year hiatus, the Golden Bears earned an at-large bid to the 2017 NCAA Tournament and pulled off the upset over eight-seed LSU in the opening round in Waco. Then-sophomore Asha Thomasled the Bears with 18 points against the Lady Tigers, matching the program NCAA record with six made three-pointers, while Kristine Anigwe added 15 points and seven rebounds. Cal came up short in the ensuing game vs one-seed Baylor, despite a 20-point, 11-rebound effort from Anigwe. The Bears enter the 2018 tournament with an overall record of 21-10,completing their sixth 20-win season in seven years under head coach Lindsay Gottlieb. Cal finished fifth in the conference standings and closed out the regular season with five wins in its final six games. After knocking off Washington in the opening round of the 2018 Pac-12 Tournament, the Bears lost a heartbreaker to 10th-ranked UCLA in the quarterfinals, edged 77-74 in a matchup that saw 12 ties and six lead changes. Anigwe and Thomas have led the Bears in scoring this season, averaging 16.7 and 12.7 points per game this season, respectively. A three-time All-Pac-12 honoree, Anigwe once again ranks among the Pac-12 leaders in scoring, rebounding, and field goal percentage and has 11 double-doubles on the year. Thomas, an All-Pac-12 Honorable Mention, has four 20-point performances in her last seven games and ranks in the top 20 nationally in free throw percentage, shooting 87.5 percent from the charity stripe this season. Senior Mikayla Cowling also earned All-Pac-12 Honorable Mention and is coming off a 16-point, seven-rebound, four-assist outing vs UCLA. Classmate Penina Davidson is second on the team in rebounding at 6.9 rebounds per game while Pac-12 All-Freshman point guard Kianna Smith rounds out the Bears' starting five. After posting a 9-2 record during the non-conference slate with their lone losses coming to Connecticut and Missouri, the Bears went 11-7 in Pac-12 play, surpassing their conference win total from the previous two seasons combined. Cal ranked among the Pac-12 leaders in both three-point and overall field goal percentage this season. Tickets for the First and Second Rounds of the 2018 NCAA Tournament will officially go on sale through the Cal Ticket Office on Tuesday, March 13 beginning at 9:00 a.m. PT. For more ticket information, please contact Coleman Spain at cspain@berkeley.edu. For more information and updates on throughout the season, follow the Bears on Twitter (@CalWBball), Instagram (@CalWBball) and Facebook (Facebook.com/CalWBball). Congratulations . . . way to go. Women go dancing. Men miss free throws.